The question needs to be asked again and again and almost on a weekly if not daily basis - "why are we still fighting in Afghanistan?" As the recent burning of the Korans and now the murderous rampage by a US solider shows, we are doing more harm than good by being there and the people of Afghanistan sure don't want us "helping them" or whatever poor excuse we are using to justify our existence there propping up the corrupt Mayor of Kabul - someone most of the Stan sees as a US puppet up to his eyes in drug dealing and corruption. The solider who went on the latest killing spree, murdering 16 women and children in the middle of the night, was obviously suffering some form of mental illness, probably from the multiple tours of duty expected by US soliders nowadays. Maybe it was PTSD that comes from witnessing your friends being blown to bits by IED's. Or maybe he had become so de-senitised from all the death, blood and guts that he'd have witnessed over his multiple tours that he just couldn't funtion as a compassionate human being anymore. It could happen to anyone. Physcological studies have proved it time and again. The soldier had a traumatic brain injury at one point and had problems at home after his last deployment, officials told ABC News. After returning from his last deployment in Iraq, he had difficulty reintegrating, according to the reports, but officials said he "worked through" those issues before deploying to Afghanistan. He is accused of walking out of the Zangabad base in Kandahar's Panjwai district early Sunday morning before going on his murderous spree. Nine children were among the dead. What does it say about the state of mind of our troops in the Stan and all the other covert wars we are not supposed to be but are most definitley fighting around the world when they break down and go on murder sprees for fun, or kill kids and women because they have just witnessed a friend being injured? When boys are brought up on computer games such as Call of Duty and Medal of Honour and trained from an early age to treat death and war as a game then it must come as quiet a shock to their senses when they actually enter a real war zone. It must be a life changing experience when you have to hold your dying friend in your arms as he coughs up blood and brain matter and you know there is nothing you can do but look into his dying eyes and hold his hand wishing you hadn't joined the army in the first place. What does it feel like to see your best mates head or limbs ripped from their bodies as they step onto a hidden mine or shot from a snipers rifle through the eye exploding brain matter all over your face. How does that affect you as a human being? How would you feel if you saw your friends, your brothers in arms, routinely killed and blown to smithereens whilst patrolling the Afghani villiages all the while believing that you are "helping" the locals by weeding out Taliban and Terrorists. How would you feel if you saw your best friend, mother, father or son brutally slaughtered in front of you for doing nothing more than being in the wrong place at the wrong time. Killed for just sleeping in their beds and hoping for a better day. One in which a bomb doesn't fall from the sky because some American drone controller things you and your donkey carrying food to your family looks like a Taliban "Terrorist" smuggling arms into Helmand Province. Would you want revenge? Of course you would! Would you feel the kind of rage and emotion that can turn the veil of civilitiy that we all like to assume into a more base instinct still within us after million years of evolution. An instinct that can take a person from a well mannered civil human being into a vicious animal intent on death within seconds? I bet you would. I know I would. I have been there before. I have seen freinds about to be hospitalised for life and gone from a still silent person into a fighting machine prepared to suffer injury to protect my mate. When you are in that state of mind you don't feel the punches and kicks raining down on you. In fact you don't feel anything. People have said that they have been shot multiple times and not even realised it until after the combat has finished. Adrenaline does that to you. Is that how the solider in Afghanistan felt as he moved from room to room hunting for people to kill. "I heard a gunshot. When I came out of my room, somebody entered our house," a 26-year-old villager named Mohammad Zahir said. "After that, I saw him moving to different areas of the house – like he was searching." Mr Nazir's father, unarmed, then took a few steps out of his bedroom. Then the soldier fired. How do you imagine the Afghanistan citizens feel who have just suffered this outrage? Are they not well within their rights to demand justice and vengeance for the act of barbarity inflicted on their wives and children? Would you not expect the same if you were in their shoes? The longer we stay in Afghanistan, the more of these incidents will occur. We have already had torture of innocents at Bagram, the "kill squad" who killed civillians for jollies, the multiple instances of Korans being burned insulting millions of peoples religions by our callousness and carelessness. We have had soldiers kill livestock for fun and now we have soldiers killing people for fun - is that just a logical progression or is it what our "leaders" want us to do. To de-humanise us and turn us into killing machines that can murder whole families of children and women without even a second thought? The reason we went to war in Afghanistan is now over and has been for many years. We killed bin-Laden - in fact he most certainly died a natual death in 2001 but whether you believe that or not is beside the point. We are not fighting al-Qaeda in Afhanistan, they can be counted on one hand and even then they are probably all linked to black ops from various intelligence agencies. Used like Sibel Edmonds claims as a perfect excuse to cause instability in a region so that we can come in and restore "order". How much "order" exists in Afghanistan at the moment? Not much by the looks of things. We are killing more civillians, less al-Qaeda (due to their not being there anymore) and creating more resentment, anger and people willing to fight for the Taliban with every drone attack and murder spree we go on. From the Guardian's report on Afghanistan Civillian Casualties. "Anti-Government Elements increased their use of IEDs and suicide attacks against obvious civilian targets. In incidents where intended targets appeared to be military, those responsible for placing or detonating IEDs showed no regard for the presence of civilians and no evidence of distinguishing between civilian and military targets in violation of the international humanitarian law principles of distinction, precaution and proportionality. Anti-Government Elements also deliberately targeted and killed civilians not taking a direct part in hostilities, mainly individuals who supported, or were perceived as supporting the Government of Afghanistan or international military forces"
This table shows some statistics. We are not fighting a "just war". We went to war in the Stan after 9.11 because the Taliban were allowing al-Qaeda to train there. The Taliban were willing to hand over bin-Laden and the other terrorists if only the US would provide some modicom of proof that bin-Laden and co were responsible for the attacks. Did we? Of course not - we don't need proof, not when the culprit has already been proved guilty in the court of public opinion and an expensive oil pipeline requires building. Even without real proof and only doctored and false evidence including fake videos of bin-Laden and ones of him talking about 9.11 with his words mistranlated and taken out of context (something we have become experts at - see Iran wanting to wipe Israel off the map) we still waged war on a 7th century country. Even with an interview with bin-Laden where he absolutley denies all involvement in the attacks of 9 .11 and actually according to Sibel Edmonds still was working closely with the CIA (I wonder what he was doing for them), we still went to war against a country that had not put one hijacker on the 9.11 planes. They were mostly Saudi Arabian, still one of our best friends despite their awful human rights abuses, feudal system, mistreatment of women. But then they have oil and let us use their country as a base for our wars of aggression. The war with al-Qaeda was won quite quickly and the Taliban sunk back into the shadows becoming the civillians they always were, biding their time waiting for the US to take their eye off the ball. They didn't have to wait long. As soon as another phony war in Iraq was set in motion the Taliban began the most successful tactic when fighting large powerful armies - gureilla combat and insurgency. Civilians that are also your enemy are hard to fight as Vietnam proved. 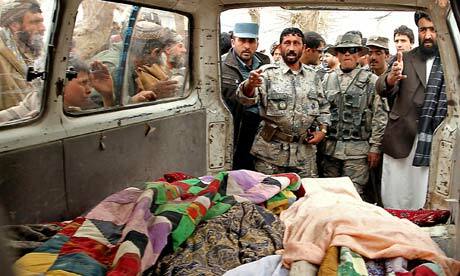 With every civillian the US/UK axis of war killed another two or three Taliban supporters were formed. We have basically killed so many civillians in that country that we are no longer fighting terrorists or even the Taliban but Afghani citizens. We will never win this battle. Therefore it comes down to a simple thought experiment and a question that I pose to you. If China invaded the USA or UK and bombed the hell out of us before installing a corrupt heroin dealing regime in Washington or London what would we think - would we great them with open arms, as saviours coming to remove our existing corrupt leaders only to replace them with others that served different masters. Would we be happy with a duplicitous regime that pretended to be pliant puppets of their foreign masters but at the same time supported the insurgency fighting them. Would you see the thousands of bombs dropping from planes and drones on your families weddings and funerals as the Chinese "helping to restore democracy" or as a great recrutiment tool that made you want to fight the foreign invaders even more. What if the Chinese kept burning bibles and going on killing sprees for fun? Throwing grenades into houses for a laugh and shooting up whole villages because they were drunk and suffering from PTSD. Would we forgive them with open arms? What would you do if a Chinese soldier broke down your family home's door in the middle of the night and killed your wife, kids and parents in front of you? What if you escaped with your life from such a killing spree. Would you hand yourself over to Chinese troops or pick up a gun and fight the people who had ruined your life. Would you still accept your new Chines overlords with open arms or would you find the nearest militia or band of rebels prepared to fight the invaders to regain their country and put your life on the line to gain revenge? I know what I would do. What about you?